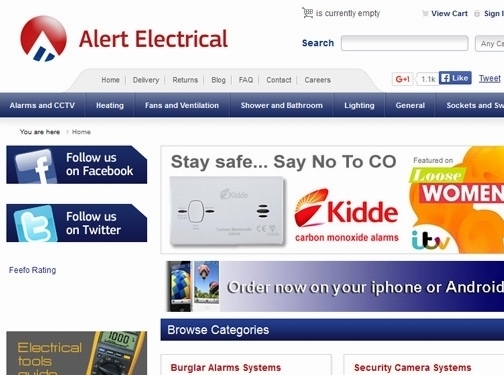 Alert Electrical are suppliers of an extensive range of electrical products including electric panel heaters, ventilation fans, electric showers and light bulbs along with security and safety related products such as burglar alarms, smoke and fire alarms, carbon monoxide alarms, CCTV security cameras and door entry systems. Based in the Midlands, Alert are well known throughout the local area as both a wholesaler of electrical products for those in the trade and also as a retail outlet for DIY and domestic customers, but of course, for those wishing to buy online they supply their products throughout the whole of the UK. In addition to selling off-the-shelf products that the home-owner can often fit themselves, Alert also stock more specialist products too. Consumer units and RCDs, earthing clamps and blocks, floor, cavity and screed boxes and a range of tools for electricians are all featured on the website as well. As well as offering all of their products available to buy online, the Alert Electrical website also contains many detailed and comprehensive buying guides to help customers find out more about the products and to aid them in selecting the right one for their needs and circumstances. UK (Ilkeston, Derbyshire) based business providing electrical supplies. Website includes e-commerce facilities, delivery and returns information, FAQs, regularly updated blog, full contact details including company registration and VAT numbers. Company website has been online since 2001 according to web.archive.org.